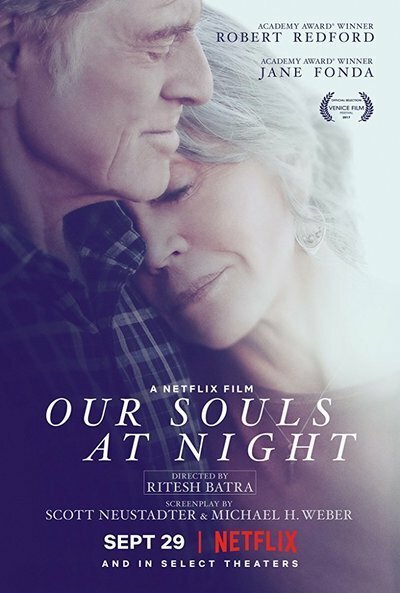 “Our Souls at Night” sounds as if it should be a noir-ish plunge into existential darkness of ravaged psyches while bloodhounds balefully howl at the moon. But that isn’t this movie, which is as comforting, low-key and unfussy as your grandmother’s tablecloth, the one she used every day and not just for company. Not that it plays it entirely safe. After all, you get to hear Jane Fonda ask Robert Redford, “Would you be interested in coming to my house to sleep with me?” An inviting proposal to be sure—although, in this case, sleep is not a euphemism for, um, you know what. She later adds, “It’s about getting through the night.” She is lonely. He is lonely. Why not? Just like widow Addie and widower Louis, neighbors in a cozy Colorado town whose paths have crossed now and then over the years, the two stars possess a certain ease and unspoken rapport when in each other’s presence, even if Redford’s character initially is somewhat taken aback by the idea of senior citizen sleepovers. He and Fonda boast a combined 114 years of acting experience, and appeared together in two lesser films in the ‘60s, "Tall Story" and “The Chase,” as well as “The Electric Horseman” in 1979. And at their ages—Cat Ballou turns 80 later this year and the Sundance Kid hit 81 last month—they have everything to gain and nothing to lose by becoming a twosome at this autumnal stage in life, much like Addie and Louis. Based on a novel by Kent Haruf and directed by Ritesh Batra (“The Lunchbox”), the setting is what one would imagine if Bedford Falls existed in cowboy country. There are banjos on the soundtrack, majestic mountain scenery and the Highwaymen on the radio. Even better, it is adapted by writers Scott Neustadter and Michael H. Weber, who were responsible for penning two of the best teen weep-athons of recent vintage, “The Spectacular Now” and “The Fault in Our Stars.” The hormonal surges in “Our Souls at Night” aren’t quite the rollercoaster ride they are in those adolescent affairs. But this steady-as-it-goes approach to a senior snuggling has its ups and downs, too. There is an undercurrent of humor along the way, but dignity is maintained. There is something essentially older-male about how Louis carries a change of clothes in a tidily rolled-top paper grocery bag while walking to Addie’s place every evening. An actual piece of luggage might just imply commitment after all, let alone leaving clothes at her place. And, on their first night together sharing a bed, Addie is so relieved to have a man’s warm body beside her, she starts snoring ever so slightly the minute her head hits her pillow. Much of the film involves these near-strangers filling in the details of their past. Louis talks about how he cheated on his wife and hurt Holly. Addie explains how her young daughter was killed by a driver after running into the street. Current-day problems also intrude in the form of her adult son, Gene (a bitter Matthias Schoenaerts), who has lost his furniture business along with his wife. He asks Addie if her seven-year-old grandson, Jamie, could stay with her for a while. That he is played by the truly talented Iain Armitage, who was a standout in the miniseries “Big Little Lies” as the suspected school bully and is the star of “The Big Bang Theory” sitcom spin-off “Young Sheldon,” makes the scenes he shares with Redford among the most enjoyable. Not only does Louis haul out an ancient model train set to distract him from being preoccupied by video games on his phone, but he teaches him how to pitch a ball. Shades of “The Natural.” Meanwhile, the always-great Greer forms a lovely and supportive bond with Fonda’s Addie in their lone brief encounter. Physical romance takes its time to enter the picture and, as the Bard once said, the course of true love never did run smooth, especially when adult children are around. An accident occurs. A move is made and a house is sold. But there is a sense that even though a distance is put between them, the story of Addie and Louis ain’t over yet.